Indianapolis Zoo has a really spacious and beautifully designed designated nursing area for moms called the "Nursing Moms Nest." This area is fully equipped with all the amenities nursing moms need plus more, including outlets, multiple comfy seats, sink, wipes, and privacy curtains. They really thought about nursing mothers needs when they built this area. "The Nursing Moms Nest presented by Riley Hospital for Children at Indiana University Health is one of the newer amenities at the Indianapolis Zoo. 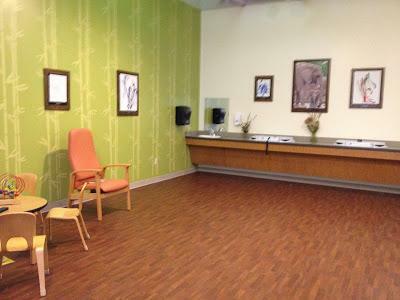 Tucked away in the Encounters Area, the Nursing Moms Nest offers a quiet place for moms to care for and breastfeed their babies in privacy. This beautifully designed space includes three comfortable nursing rooms, a changing station and wash area, and an activity area where older children can sit and play while mom is breastfeeding nearby. The Nursing Moms Nest is one of only a few such facilities located at Indianapolis-area attractions and was a top priority for the Zoo when designing the Flights of Fancy exhibit."